You know how it is……sometimes you finish a project and then search and search to find the next one that will absolutely inspire you? 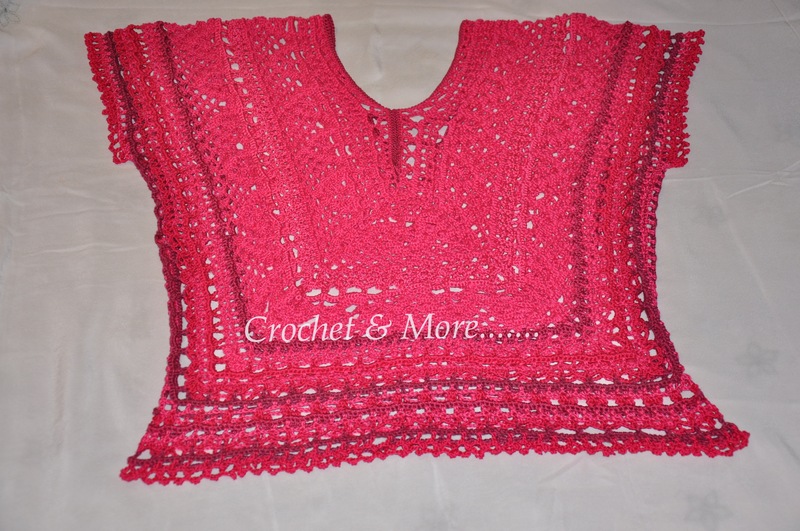 Well….I go through that every time, I finish with one…and then feel so bereft…..what do I do next….It was in one of those searches that I came across this top…but it didn’t have a pattern to go with it….so after googling endlessly….I asked my pals in Passionate Abt Crochet….if they could help me out…and Lo Behold! !…I find that there is an entire group of 3000 and more members dedicated to making the top….the group is headed by the wonderful Linda Augustsson who has put the pattern together and explained the whole thing in a manner that makes it very easy to work on….I of course tweaked the original pattern a little here and there…to suit my age and figure…and am really very happy with the end result…it is a beautiful design….My Namasakar to the brilliant and talented designer who came up with the design. As I said before, there is a group exclusively devoted to making this Tunic…..I suggest that you join this group. Here is the link to that group. https://www.facebook.com/groups/LetsMakeATunic/ The group has more charts and lots of chats where doubts are explained. Those of you who follow my blog must know by now that I love to mix different kinds of yarn and thread together. 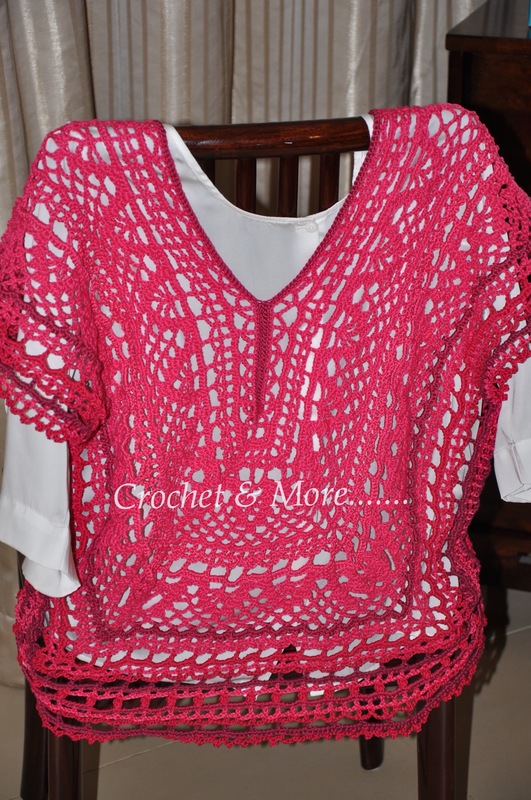 I used Bali Yarn, Mercerised Thread and Bamboo yarn in different shades of pink and mauve. Total: 280gms….I would advice you to keep 300 gms in hand. I am a size 12(UK) so you will need to reducer increase the amount of yarn/thread that you will need accordingly. So the chart you see below is one end of the pattern that goes around. the gap in the centre is the neck. You start with 288 chains. This is the other end of the chart. 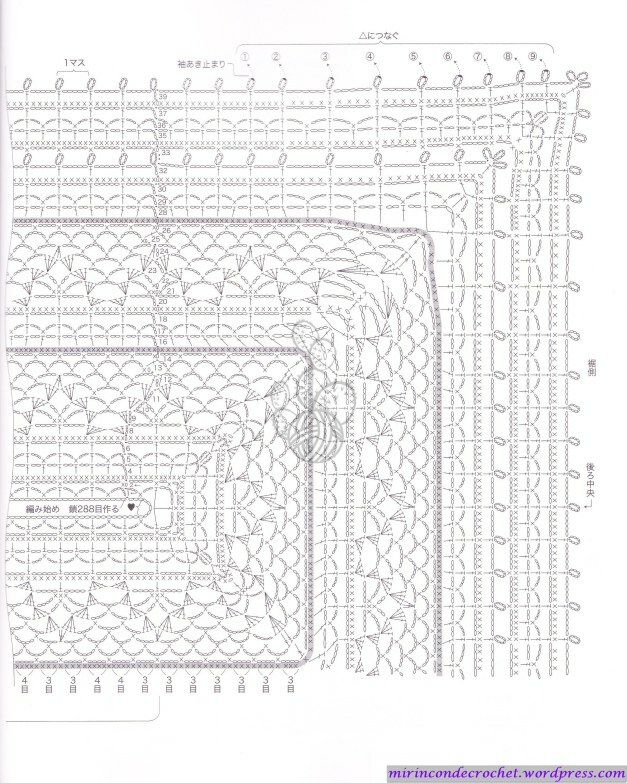 The chart doesn’t show all the stitches that go around but it is easy to figure it out. 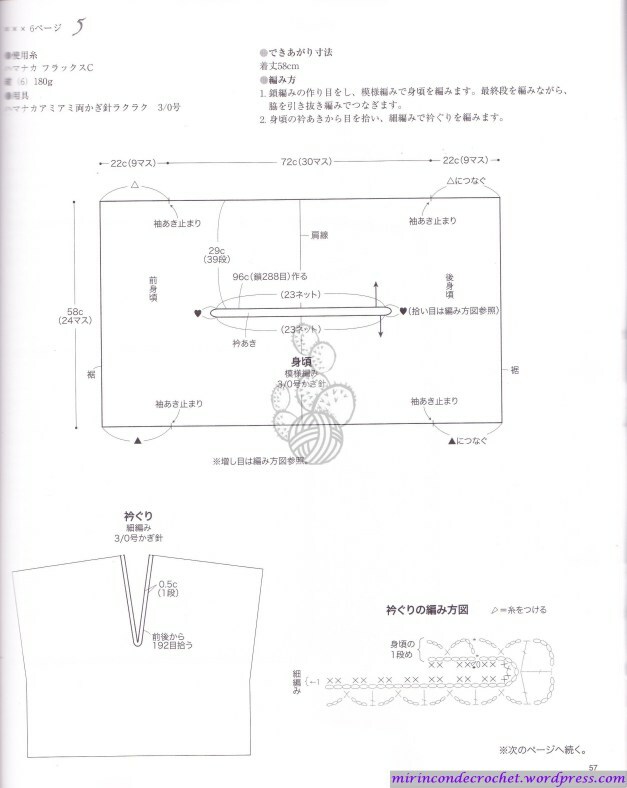 Here is a diagram of the finished top…this is the shape you will get once you are done…Then you need to fold it into half, and join the two sides. 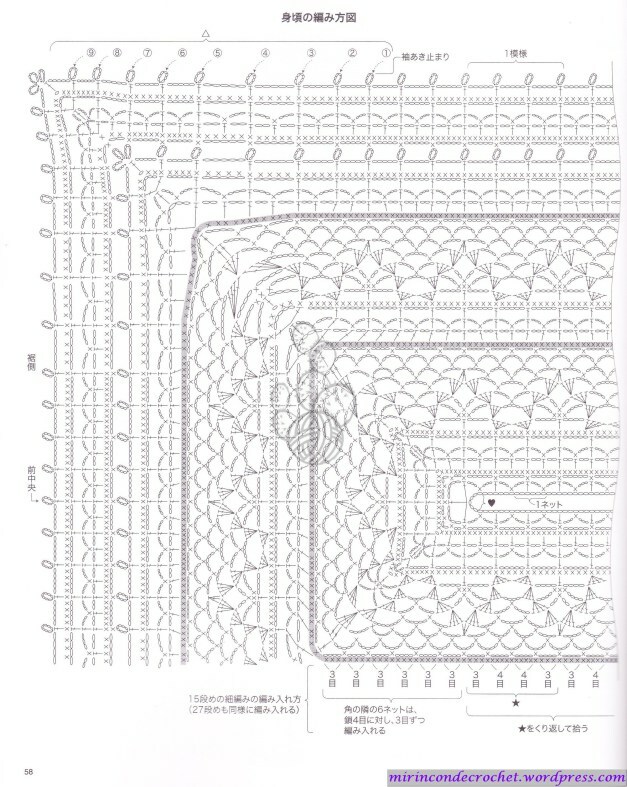 This is the centre of the pattern, it is here that you begin the pattern. 1st Row: Chain(ch) in 288….Here what you are doing is making the neckline. That is how this tunic is worked you work from the neck and work it outwards. 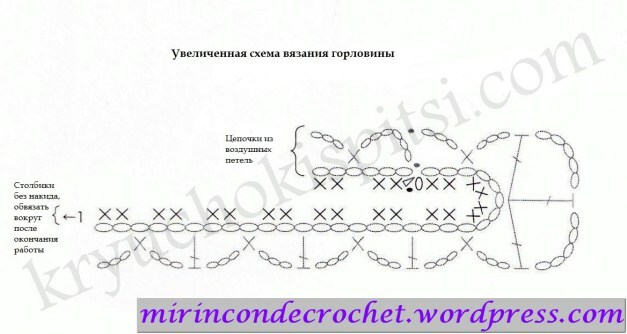 Make a slip stitch joining the last chain to the first chain…thus forming a circle. While making the slip stitch(ss)…be careful not to twist the chain…all the chains should be face up. 2nd Row: Chain in 6 chains skip 2 chains. 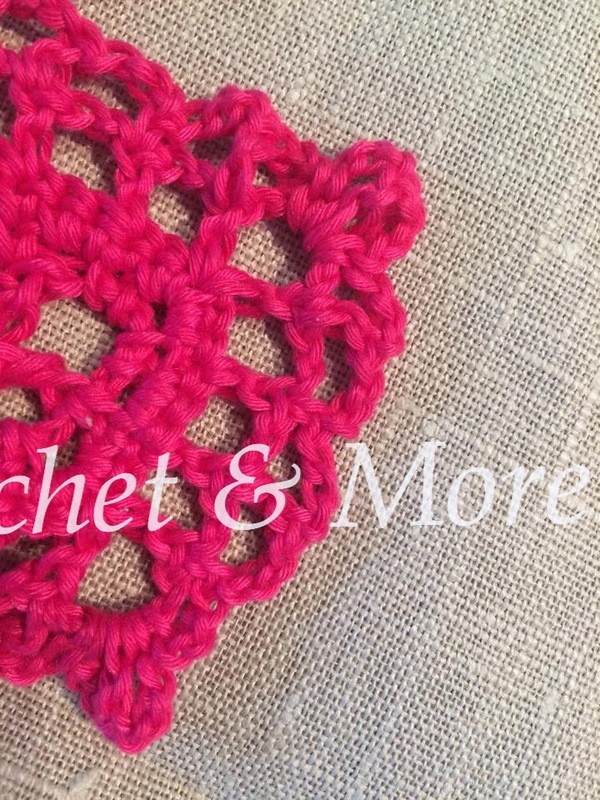 Hook in a single crochet(sc). Ch 3, skip 2 ch, one double crochet(dc) in the next chain. ; skip 2 ch;3 ch; sc in next ch. *Chain 3, skip 2 chains, dc in next chain; 3ch; skip 2chs; sc in next ch. * Repeat 21 times…23 in total. 3ch; skip 2 ch; dc in next ch; 5 ch; dc in same ch as the last dc ch; 5 chs ; dc in same ch as the last two chains; then hook in ** 23 in all. End with a ss. 5 ch up; skip 2 sc of previous row; 1 sc in next sc from previous row. continue until you reach a corner…. 2ch;Skip 2 ch; 1dc ;skip 2 sc of previous row; 1 sc in next sc from previous row;continue until you reach the next corner . Repeat until the round is finished. ss in 3rd ch on the beginning 3ch. one chain up; sc in every previous stitch all around. When you reach a corner..you make 1sc; 1ch; 1sc….should be made in each corner. Then ss. Chain 6 up; *sk 2ch; sc in dc;3ch; sk 2ch; dc in dc;* Work ** except at each corner. To End the row: ss into 3rd ch on the beginning 3ch. Chain 8; #sk 3ch, sc 3ch# ; then dc in dc; *5 ch, sk ## dc in dc*; Work ** except at each corner. To End the row: ss in 3rd chain on beginning 8 chain. 1 ch up; 4 sc in each 5ch loop all around except corners. To End the row: ss in 1st sc. 3ch up; 3dc in same starting chain (that is 4dc in the beginning sc). Sk 5 scs; 4 dc in next sc; 4 ch sk 4 scs; *4 dcs in next sc, sk 4dcs, 4dc in the 5th sc*.Work ** except at each corner. In each of the 4 Corners: 5ch, 1dc into 3rd sc in the 5 sc corner of the previous row. then 5ch. To End the row: ss into the 3rd ch of beginning ch. 3 ch up, 3dc in the same sc; *4ch, 4dc in 4th dc of previous 4dc; 4ch, sc in the last ch of the previous 4 chain loop, then sc in sc, and sc in the first chain of previous 4 chain loop. ;4 dc in first dc of previous 4dc*. Work ** except at each corner. 3 ch up, 3 dc in same 3ch of previous row; *4 ch, sc in 4 ch loop; 5ch, sc in next 4 chain loop; 4 ch ; 4 dc in last dc of previous row 4 dc; 4 dc in 4 dc of previous row. * Work ** except at each corner. In each of the 4 Corners: 7 ch,4 dc in 4 dc of previous row,4 dc in the next 4 dc of previous row. (Stretch the 4dc stitches|, so that it doesn’t cause a crinkle in the corners or loosely crochet those 2 4dc stitches that make that corner) ; 7ch . 3ch, dc into next dc;* 4 ch ,sc in 4ch loop, 5 ch, sc in 5 ch loop, 5ch, sc in 4 ch loop, 4 ch ; 3 dc tog(together) in the joining dcs below( first dc in last dc of previous 4dc, the next 2 dcs in the next 2 dcs of next the 4 dc of the two dcs of previous row. )* Work ** except at each corner. In each of the 4 Corners: 5ch, 4dc in first dc of the second 4 dc of previous row, 5 ch. 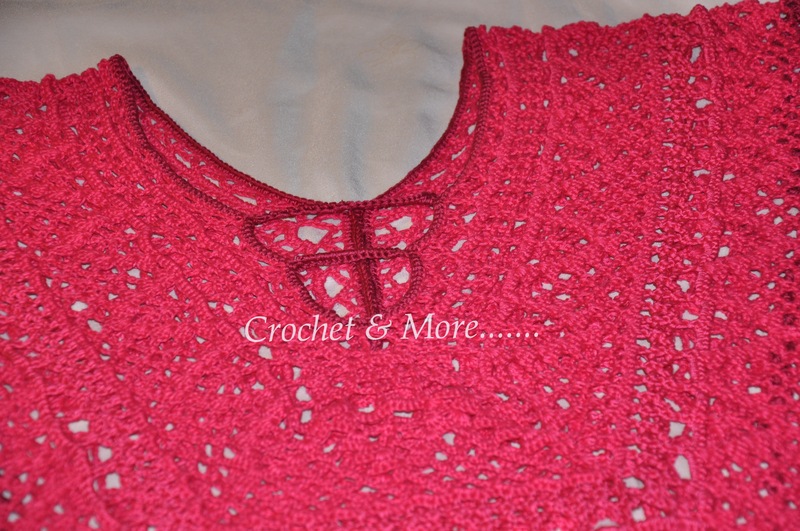 The neckline….I reduced the neckline by hooking single crochets all around and then joining the sc border together in the front. Just to show you the stitches at a closer range…. I gave the pattern a bit of a contour at the waist and hips….. I have written out the pattern to the best of my ability….but as mentioned the written pattern hasn’t been tested, and once or twice I have done my own thing…..when in doubt pls do refer to the chart given above….Hope you have as much fun as I did when making this lovely top. Thanks for the pattern. I will try the same and reply you once I am able to complete it.